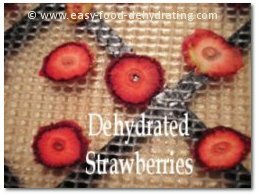 Dehydrating strawberries is easy and are great for snacks, baked goods, and cereal topping. Strawberries are high in vitamin A, vitamin C, followed by Choline and vitamin K. There are trace amounts of vitamin E, Betaine, Pantothenic Acid, Niacin and vitamin B6. 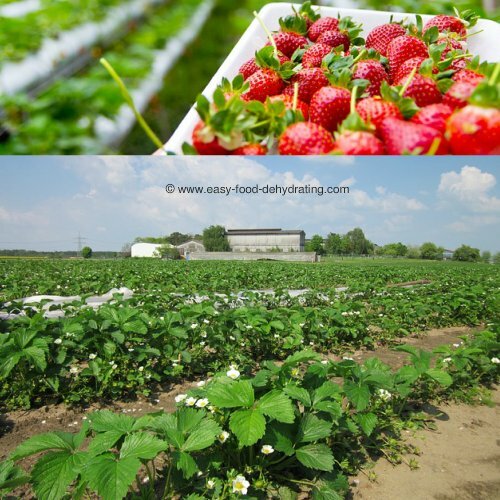 In the mineral department, strawberries are high in Potassium, followed by Phosphorus, Calcium, Magnesium, and Fluoride. Strawberries have trace amounts of Selenium, Manganese, Iron, and Copper. Strawberries contain Omega-3 and Omega-6 fatty acids too. Obtaining strawberries fresh from "You Pick 'Em" farms, is probably the best way to go of obtaining sweet big strawberries ... so long as you don't 'put your back out' bending down! Strawberries are easy to grow in pots, or in beds, no matter the size of your backyard. Don't forget to check out how easy it is to dehydrate all kinds of fruits. Check out our main Fruit page here. 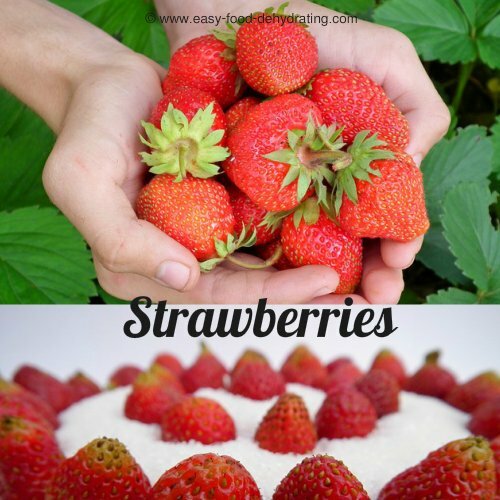 If using frozen strawberries, slice them when they are partially thawed – then go to step 2. If you decided to simply cut your strawberries in half, place them on your food dehydrator trays with the cut-side up to prevent drips on the lower trays! Drying time: between 6-15 hours. Dehydrated strawberries will be crisp and leathery when dried. Add Re-Hydrated Strawberries To Smoothies! How about this (it's a great way to get your vitamins) – start eating more fresh fruit instead of taking vitamin pills! The body needs the "good carbs" and NOT the "refined carbs" that are prevalent in cookies, cakes, and pasta – and bread. Add strawberries to morning smoothies – delish! After you've dehydrated your strawberries, you'll want to pack them away safely. 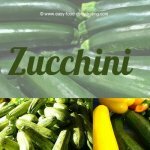 Learn how to do just that by reading our Storing Dehydrated Food page. We cover the six steps from buying to storing! Speaking of the six steps, don't forget to sign up for our free Six Simple Steps eBook! Visit our home page to learn more.